This meet is set to be amazing, and with a brand new qualifying structure from Group Championships we are excited to see how it all turns out. This is the hub for updates and live results, we will have photos and video interviews uploading after the meet. Good luck to everyone out there today. Run fast, throw far, and jump to new heights. Quick notes and updates will be posted below, when full results are available after each event they will be posted on the meet page. We will have photos and video interviews going up after the meet so make sure to check back this whole weekend! Meet is set to go off at 2:00 pm. Article by Robert Kellert and Jim Lambert. As events come in they will show up here linked to the event title. We may have winning times before the full results are available. Girls 4x400: Winslow wins in 3:46.67. Girls javelin: STATE RECORD ALERT!!! BRIELLE SMITH 163-8!!!!!!!! HOLY SMOKES!!!! Girls 4x800- Ridge wins 4th straight title running 9:03.19! This school has such a decorated history indoors and outdoors in this event. Girls Shot Put - Shelby Bigsby wins her first outdoor MOCs title and second overall throwing 47-05.75. She'll have one more meet at New Balance Nationals to try and become just the third girl in state history to break 50 feet outdoors. Currently ranked US#5 on the season at 49-00. Girls Long Jump: Tionna Tobias of Winslow wins with 19-5 1/4. Boys High Jump: Jaden Watson of Paterson Kennedy wins at 6-8. Boys 3200m - Devin Hart goes under 9 minutes in the 3200 to win 2nd straight title in 8:58.58!!!! That came less than 24 hours after running 8:53.36 in the two mile on the west coast! Girls 3200m -Alexa Westley wins her 2nd straight title in 10:30.06!! Girls High Jump - Tiffany Bautista won her 3rd gold of the meet on misses at 5-10!!! She also won the TJ and anchored the winning 4x100. Boys 200m - Antonio Tarantino of Paul VI wins. Heslop didn't run. Girls 200m - Lauren Princz of Egg Harbor wins in 23.90. Girls Pole Vault - STATE RECORD ALERT!!! Hayley Horvath of Notre Dame broke the state record with a clearance of 13-03.25. Horvath just made 13-05.25! She went out at 13-7.5. Girls 800m - Victoria Vanriele of Governor Livingston takes the 800m win in 2:06.68. Boys 100m -Mario Heslop wins in 10.66. Girls 100 HH -Amaya Chadwick wins in 13.77. Richards also clocked in 13.77. Boys 400m -Mario Heslop wins in 47 low. Boys Javelin - STATE RECORD ALERT!!! NICKOLAS MIRABELLI-227-10!!!!! Girls Discus -Catherine Light of Demarest wins with a 132-2. Boys Shot Put - C.J. Licata of Gill St. Bernards throws 64-06.75 NJ#1 US#10 to win his second Meet of Champions title, he won his first this past indoors. Boys 4x100m - Deptford rolls in the 4x100, wins 41.47. Looks like a sub 42!! Girls 4x100m - Paramus Catholic holds off Egg Harbor to win in 47.17! Official results still to come. Boys 1600m - Drew Maher wins in 4:08.80!! Girls 1600m - Abby Loveys of Randolph wins in 4:46.03! Chloe Gonzalez of North Hunterdon gets 2nd. Loveys passed Gonzalez with about 60 meters to go. Boys 110m Hurdles Prelims - Sincere Rhea runs a NJ #1 13.80. Girls 100m Prelims - Sydney Hawkins the 1 seed into finals running 11.88, the only one to break 12 out of prelims. Boys 100m Prelims - Mario Heslop leads us into the finals with a 10.52! Boys Wheelchair 1600m - SUB-FOUR! Miguel Jimenez-Vergara of Notre Dame wheels his way to a sub-four 1600m officially at 3:58.91! He took down his own meet record of 4:01.11 from last year. Girls 400H - Reanda Richards of West Essex wins her first M of C title after two runner-up finishes with a time of 59.05. 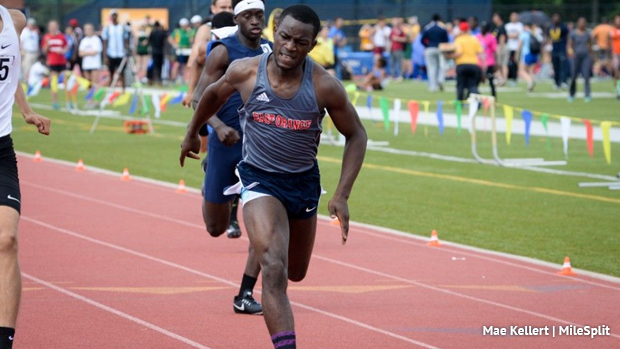 Boys 400H - Akeem Lindo of East Orange catches Jameson Woodell of Hunterdon Central right at the line to win in a NJ #1 US#3 52.28. Woodell 2nd in a NJ #2 US#5 52.35.